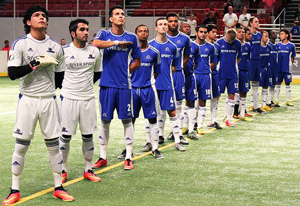 The Tulsa Revolution began a new era in their new building with a 9-8 win over Rancho Saltillo Seco on Friday night. Victor Gouea and Lucas Almeida each scored three goals to lead Tulsa, while Levi Coleman notched two goals and two assists. The home team had a four goal advantage at the game’s half and nearly allowed Saltillo back into the match in the fourth quarter. It was the first win for Revolutions interim head coach Alex Miranda since he took over from Dave Yates in mid-Jaunary. 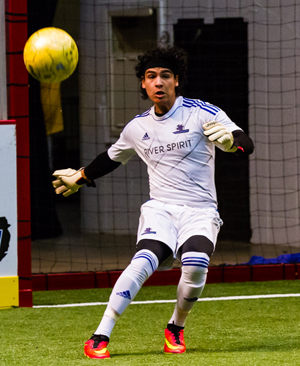 Tulsa will be in action again this Friday night when they take on the Milwaukee Wave at 7:05pm in the Fairgrounds Pavilion. The visitors got on the scoreboard first with a goal by Manuel Valentin at 9:31 of the first quarter. Tulsa tied the match, as Lucas Almeida punched the ball off the corner boards to Victor Gouea, who put it into the net, at 12:04 of the first quarter. At 4:54 into the second quarter Lucas Almeida scored on a goal assisted by Bryant Scrapper, and Tulsa took a 2-1 lead. Less than a minute later, Levi Coleman scored his first goal of the game, but just a minute later Coleman picked up his second of the night on a pass from Bruno Simoes, and Tulsa had a 4-1 lead. Almeida took a free kick from the top of the arc, at 8:02 into the second quarter, and he put the ball it into the upper right corner of the goal. Tulsa led 5-1 at that point. With less than a minute remaining in the second quarter, Rancho Seco got a goal by Mario Hernandez to cut Tulsa’s lead, 5-2. Tulsa quickly answered with only 6-seconds left in the half on a goal by Bruno Simoes assisted by Coleman. Tulsa led at halftime; 6-2. Less than two minutes into the third quarter, Alejandro Martinez scored for Rancho Seco, cutting Tulsa’s lead to 6-3. At 4:09 of the third quarter, Victor Baez scores for Rancho making it a 6-4 game. With 2:39 left in the third, Gouea scores to put Tulsa up 8-4. End of the third. Two minutes into the fourth quarter, Rancho gets another goal by Baez, to cut the Tulsa lead to 8-5. Rancho scored again with 11:20 remaining in the fourth, on a goal by Gutierrez. Tulsa 8 Rancho 6. Just a couple minutes later, Rancho Seco got another goal from Gutierrez, to cut Tulsa’s lead to one, 8-7. Goal by Tulsa Gouea assisted Coleman with 4:52 left. Tulsa lead 9-7, and late in the fourth quarter, Gutierrez scored again to cut the Tulsa lead to one, once more. This entry was posted in Sports on February 2, 2015 by admin.